use those SSH keys to secure Git operations between their computer and the Bitbucket Server instance. Bitbucket Server users must each add their own SSH key pairs to their Bitbucket Server account to be able to use SSH access to repositories. Supported key types are DSA and RSA2. Note that RSA1 is not supported. We've tested key sizes of 768, 1024, 2048, 4096 and 8192 bytes. There are performance implications for Bitbucket Server when using SSH. When users connect to Bitbucket Server using SSH the encryption of data adds to overall CPU usage. See Scaling Bitbucket Server for more information. To implement SSH authentication support, Bitbucket Server bundles a version of the Apache Mina SSHD server. Bitbucket Server's SSH server is not integrated with the SSH server on the host Bitbucket Server is running on nor does it consider the users on the host when authenticating Bitbucket Server users. To prevent security issues, the embedded SSH server has been locked down to allow execution of a small set of commands for Git hosting. The only commands that are supported are git upload-pack, git receive-pack, git archive-pack and whoami (a custom whoami implemented in Bitbucket Server not the whoami command that exists on Linux). It is not possible to open an SSH shell using the embedded server to execute arbitrary commands on the server. Under 'SSH access', check SSH enabled. Enter values for SSH port and SSH base URL, according the information in the sections below. These options will only be available if the "Bitbucket Server - SSH" add-on is enabled. For instructions on how to enable this add-on on your instance, please refer to Disabling and enabling apps. 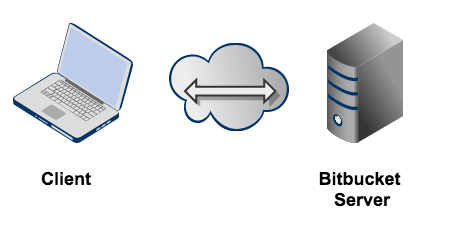 The SSH base URL is the base URL with which users can access the SSH push/pull/clone functionality of Bitbucket Server. This is the base URL that Bitbucket Server will use when displaying SSH URLs to users. If you do not set this, it will default to the host that is set in Bitbucket Server base URL, with the port that SSH is listening on. See Specifying the base URL for Bitbucket Server. If you set up port forwarding, you will need to set the SSH base URL to the machine and port that is being forwarded to Bitbucket Server. However, you do not need to specify the port portion of the URL if the default SSH port (port 22) is being forwarded to Bitbucket Server. If you run Bitbucket Server behind a http proxy such as Apache (e.g. as per our instructions), and if Apache runs on a different host, SSH will not be available on that host. Instead, you will need to set the SSH base URL to the machine Bitbucket Server is actually running on (and the URL should include the SSH port Bitbucket Server is serving from). If you set up port forwarding, you will need to set the SSH base URL to the proxy machine and port that is being forwarded to Bitbucket Server. However, you do not need to specify the port portion of the URL if the default SSH port (port 22) is being forwarded to Bitbucket Server.